Chicago, IL: Earlier this year, Forbidden Root Brewery, the first botanical brewery in Chicago, announced plans to distribute its beers in Florida through Cavalier Distributing. The beers feature flowers, roots, leaves, herbs, and other ingredients found in nature. Meanwhile, in Italy, the Branca family has produced generations of the renowned Fernet-Branca Italian Digestive Bitter liqueur, a proprietary recipe of 27 herbs, roots and spices. 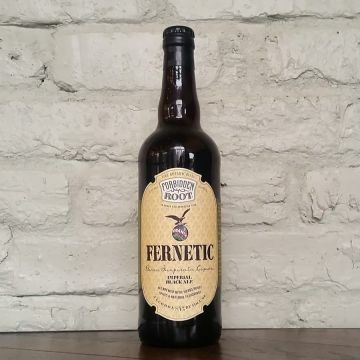 It may be no wonder that the two have collaborated on Fernetic, an Imperial Black Ale (8.4 ABV) crafted from a blend of 20 natural ingredients, including rhubarb root, saffron, peppermint, and star anise, among others. The creation seeks to embody the famous Italian liqueur in the form of a beer. Described as an "exotic, spicy and complex beer" ... "with hints of coffee and peppermint on the nose," the beer offers a "soft roastiness" while "bitter notes build to a spicy, creamy middle and dry woody finish," according to a Cavalier Distributing press release. The unique beer will be available in Florida for limited distribution, beginning with a launch event and tapping at The Ice Plant in St. Augustine on June 21, at 5pm. A cocktail competition during the hours of 3-5pm will immediately precede the tapping, which is the first of only three kegs being released in the state. Representatives from both companies will be present to discuss the collaboration. The first 100 guests to purchase a snifter of Fernetic will receive a souvenir snifter. Subsequent launch events and tappings will take place at Sweetwater Bar & Grill in Boynton Beach on June 22, and at Blue Goose in St. Petersburg on Friday, June 23.